The death toll in the Mashava commuter omnibus accident has risen to 5 after two more people died at Masvingo General Hospital where those injured were admitted. Three people died on the spot when the commuter omnibus they were travelling in burst a tyre resulting in the vehicle overturning along the Bulawayo-Masvingo highway in Mashava. The number of those injured now stands at 18, including 4 children, following the death of 2 more people at the hospital. The accident occurred around 11am today. When the ZBC News arrived at the scene, bodies of the deceased were still at the scene while the injured had been ferried to Masvingo General Hospital. Villagers from Mashava who assisted in lifting the injured onto ambulances said the commuter omnibus was overloaded and appealed to drivers of public service vehicles to exercise extreme caution on the roads. 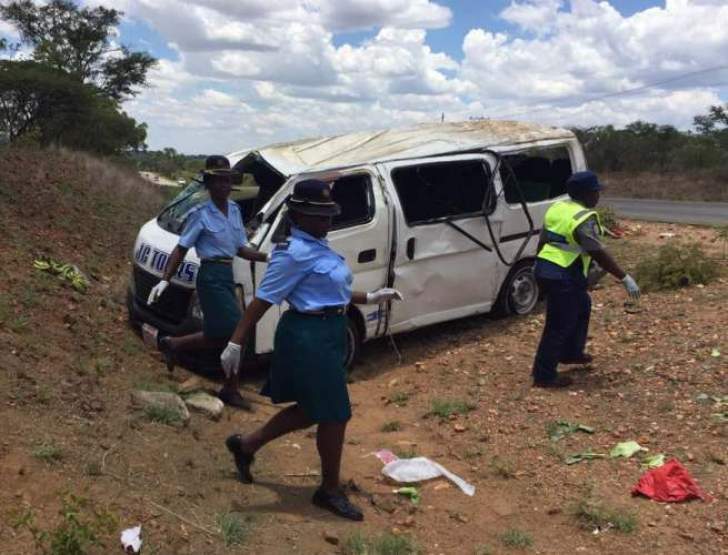 ZRP Officer Commanding Masvingo District Chief Superintendent Godwin Chikuma who was at the accident scene said the three who died on the spot were all female, revealing that one of them was an expecting mother. He urged motorists to drive with caution. While commuter omnibuses are generally expected to carry 15 passengers' police indicated that the vehicle had 23 passengers. The names of the deceased are still being withheld as their next of keen are yet to be informed.